I apologise for not posting more during my residency at Boneca de Atauro. I did so want to share the experience. But technology defeated my intent and in a way that was not surprising. Yes I could post from my phone- mainly on facebook- but the connection was 2G and so I could not get the hotspot connection to work with my laptop, as Windows 10 decided to update whilst I was fiddling around so that was the end of any meaningful connection with the internet. I am afraid I cannot type anything of any length on my telephone no matter how much I try. I still actually like to write down thoughts by hand before typing them onto my laptop. I find the act of writing by hand helps me to think. Anyway the internet connection whilst a bit frustrating is hardly surprising given that Atauro island is really quite isolated. It lies 25 km off the coast of Dili and on the dragon Boat ( fast boat) it takes an hour, on the ferry it takes about 3 hours. In Portugese times it was used as a prison and during the Indonesian invasion it was used as a prison for the families of the Resistance fighters on the mainland thereby more than tripling the population of the island and causing great hardship for the existing inhabitants and the imprisoned ( this was because of its isolation and also lack of resources to support so many people). Life is very simple on Atauro Island. There is a weekly market at Beloi, there are shops, more like kiosks, and no supermarket. A lot of fish and chicken is eaten, vegetables, including potato are those grown on the island ( and are very good ) and rice. There are few cars because there are not many roads, most transport it by tuk tuk or on foot.The electricity is powered by a generator which operates from 6pm to 6 am, so there are very few fridges, washing machines, though I did notice quite a few tv's. Maturina Ajuoro showing where to stitch on the linocuts to one of the Boneca ladies. The temperature ,the entire time I was there, was around 30 degrees Celsius day and night , and sheets were useful for wiping away perspiration , but way too hot to sleep under. When it rained it pelted down like an avalanche. The first day or so I was there I wondered at the very deep drains that ran alongside the road, when the rain came I understood why. So this makes, what the women at Boneca de Atauro do all the more amazing. They do have a generator but that is only run sometimes, because the Diesel comes form the mainland , and it is not exactly easy to bring over. There is no petrol station on Atauro Island. All their work is done on treadle machines which they maintain themselves and repair themselves. The materials they use are also not easy to obtain though we are going to look into what can be done about that. It seems to me if the Bali Batik patchwork fabric comes from Bali ( or probably Surabaya) there must be avenue to explore getting better fabric. Eva proud of her stitching she did on a commission of Mount Fuji for a Japanese customer. Stitching on a linocut printed fabric with hoop and bare needle- it takes great precision and your fingers are always in the danger zone! The people themselves are quiet people. They attend mass on Sundays, and I could hear it every morning because the church has a loudspeaker. I also attended on occasion. The thought that crossed my mind was, that surely there are not many priests in the world who would experience such beautiful singing every morning in such a simple church. The people love to sing and do so beautifully, and timorese music definitely has its own flavour and spark, even the national anthem is quite lovely. The Vila Mau-Meta end of the island is Catholic and at Beloi it is protestant dating from some seventeenth century missionaries who settled there . And herein lies another one of my pet hates about tourists. The people are conservative and ask that tourists respect this so whilst it is ok to wear a bikini on the beach ( where there is great snorkeling) they ask that you not walk around the market or town in your bikini or skimpy tops and shorts. And that is exactly what some tourist do- total disregard of local habits and customs and then wonder when the local people don't want much to do with them. So during my residency we worked hard creating a new product, making linocuts, learning printing. The residency is all about passing skills to the women at Boneca. They do not have the opportunity to learn these things on Atauro Island or indeed Dili ( which is still recovering from the damage of Colonialism, the second world war when it was invaded by the Japanese and the Indonesian invasion until recently), and so they are like sponges to learn new things. I worked with 3-4 women who will then pass on what they learnt to the other women. But because i was there every day working with the women ( 6 days a week) people inevitably came to see what we were doing and because they also stitched the linocuts the interaction was far greater because they were keen to learn how to get best results for this. The women work on Singer treadles machines with embroidery hoops and bare needles- this takes some skill- I know because I tried it and it was not easy! Jacinta de Costa printing a piece of cloth with the linocuts that she and Virginia Saldahna made during my residency. We are using a wine bottle filled with water to create the pressure- This works really well. We also ended up working with Rapan Hirik which is a fibre woven on the island made from the rapan hirik palm and which sews remarkably well. I had hoped to stitch a travellers blanket at night but the reality was that it was too hot to do anything meaningful at night except read or write. The drape of any additional cloth on your body was just too much. The end result of the residency was to be an Exhibition at the Boneca shop in Dili to celebrate the 10 years that the co-operative has existed ( with no NGO funding and very little other funding so it is actually sustaining itself and the work of 60 women) In the last year or so they have received some funding from MDF which is a Market Development Fund funded by the Australian Government and is very much about market development and learning those skills. The other exciting thing is that the ladies from Boneca de Atauro will be coming to the Australian Quilt Convention in April 2019. So the photos I am sharing are of some of the work they created for their 10 year exhibition. The applique on rapan hirik is new work for the ladies as is the linocut printing and stitching. It was lovely to display it in a gallery like space next to the Boneca shop in Dili and were were chuffed that a third of the pieces were sold on the Opening day of the exhibition. The work they created included some of their earlier style of work as well as work that developed during my residency- we wanted to show the variety of 10 years of work! 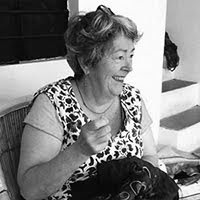 If you are interested in the Boneca de Atauro story please read some of their history on the Boneca de Atauro website- it is a wonderful story of love and commitment and of women doing what they can and creating something super special . I am extremely grateful to Ester Piera Zuercher- Camponovo and David Palazon for thinking of the residency idea and of course to all the Boneca women for the wonderful experience- one that will continue into the future.I loved working with women who were so keen to learn, their willingness to step outside their comfort zone, to my students who brought gifts of baskets and mangoes and pineapples and their smiles and laughter and songs.And thank you Virginia Soares the president of the co-operative for your help , and your willingness to learn and your dedication together with Maturin Araujo to the women at Boneca! The Boneca de Atauro shop in Dili in Pateo Square- we are all set for the exhibition Opening! The long spindly tree is the Atauro Island kapok tree which is used in making the Boneca dolls. The positive has been put onto the rapan hirik and the negative has been appliqued. likewise with the rapan hirik leaves. And of course I have a wish- that involves older Bernina Sewing machines. As I said the women do have a generator so they can power some machines sometimes. I am looking for anyone , in Australia , who is willing to gift their older mechanical Bernina machine with a darning foot- I ask for Bernina machines because I know what workhorses the older machines are and are also easier to maintain ( there is no dealership in Timor closest is the east coast of Australia). I have already been offered one machine by Doreen Dyer in Darwin ( thank you Doreen )- I would love to get a few more and then find a way of getting them to Atauro island. I know two or three young women who will be singing songs on those machines. Dawn was the only time cool enough to go for a walk ! And last but not least I wrote an article about Boneca de Atauro for Handeye Magazine which was published for their last edition for 2017 . It took quite some doing getting the images and writing to them due to the internet difficulties- but it did eventually get there and how lovely to be in their magazine just prior to Christmas! Such a great experience, Dijanne & clearly, very satisfying. Wow...some amazing work and thanks for all the history too. Happy Holidays! You can get them from touching her skin, but not from textiles. One bottle of Compound-W bought over the counter will take care of any warts that infect you.